Max Cavalera and his band Soulfly have announced a string of UK shows next month to coincide with the release of their seventh studio album, ‘Omen’ which is in stores on May 24. The four-piece will play the following dates. Tickets are on sale now. A special edition of the album will also be available, featuring three bonus cover versions: the aforementioned Exel and Sepultura tracks, plus Led Zeppelin’s ‘Four Sticks’. Also included in the package is a DVD which features the music video for ‘Unleash’ plus a full length set of the band’s performance at Germany’s With Full Force Festival last July. On this the band play 18 tracks including: ‘Blood, Fire, War, Hate‘ / ‘Sanctuary‘ / ‘Prophecy‘ / ‘Back To The Primitive‘ / ‘Seek N’ Strike‘ / ‘Living Sacrifice‘ / ‘Enemy Ghost‘ / ‘Refuse/Resist‘ / ‘Doom‘ / ‘L.O.T.M‘ / ‘Molotov‘ / ‘Drums / Warmageddon‘ / ‘Policia‘ / ‘Unleash’ / ‘Roots Bloody Roots‘/ ‘Jumpdafu**up‘ / ‘Eye For An Eye‘. 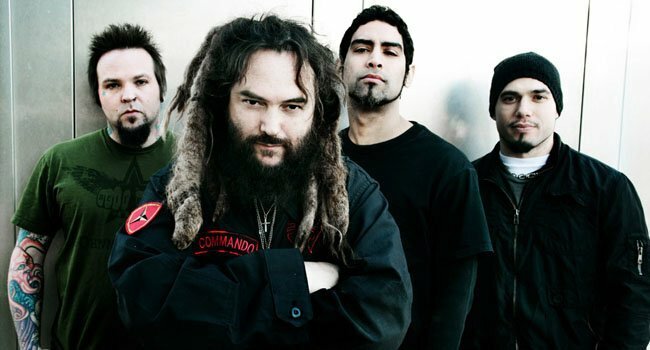 Soulfly will return for further touring later this year.